With Samsung’s upcoming Galaxy Tab S2 models scheduled to release next month, we have received the latest pricing details that will be stamped on both the 8.0 inch model and 9.7 inch one. Naturally, since both of these large screen devices belong to high-performing tablet category, do not expect them to come cheaply at any costs. According to the latest pricing leak, Galaxy Tab S2 8.0 is going to feature a price of 11,900 Vietnamese Dong, which when converted in to USD, brings a grand total of $550. 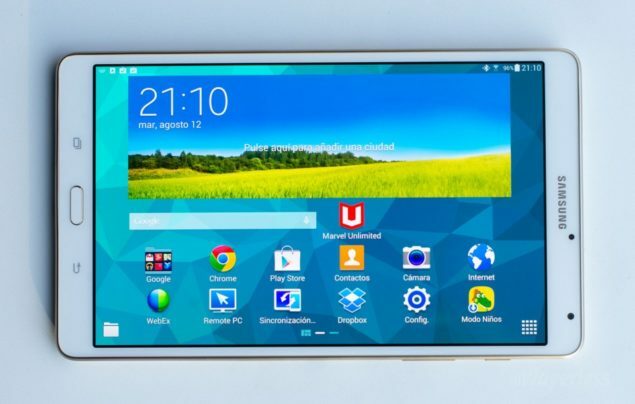 As for the larger screen sized variant, Galaxy Tab S2 9.7 will feature a price tag of $730. While both of these large screen slates are a tab bit expensive compared to the remainder of the tablets, the incorporation of powerful hardware is what has brought them to this price range. Both Galaxy Tab S2 models will feature an Exynos 5433 SoC, which can easily takedown a Snapdragon 805 in the latest AnTuTu benchmarking results. Additionally, both slates are going to feature 3 GB of RAM, which is the amount that was present in the company’s Galaxy Tab S lineup. As far as the resolution is concerned, Samsung has reduced that from 2560 by 1600 pixels, to 2048 by 1536 pixels. For those of you complaining, the reduction of the total number of pixels will deliver more battery life to the user, and with Samsung’s refined TouchWiz interface, you can rest assured that you will have more available system resources to carry out the more intensive tasks. While we were anticipating that both Galaxy Tab S2 models will be assimilated with an Exynos 7420 SoC, Exynos 5433 is no slouch either when it comes to performance. Both slates will be available to purchase in the Wi-Fi only and Wi-Fi + LTE models, but the pricing leak does not specify which models will feature the aforementioned price tags. However, we have a hunch that these models only possess a Wi-Fi adapter since Wi-Fi + LTE models are shipped out later in the market. In any case, we will be keeping you up to date with the latest info, so stay tuned.